MOSCOW - Russia will proceed with plans to provide Syria with an advanced air defense system, in part to prevent foreign "hot heads" from getting involved in the country's conflict, a top Russian diplomat said today. 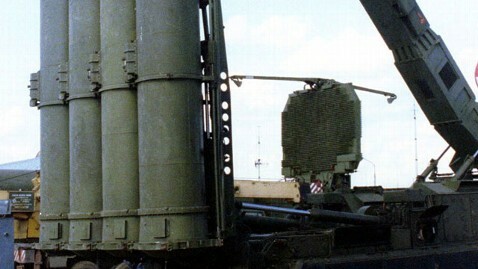 Deputy Foreign Minister Sergei Rybakov confirmed plans to deliver the S-300 system, but would not confirm when it would arrive. The S-300, one of the world's most advanced air defense systems, could make it harder for foreign forces to carry out airstrikes inside Syria, as Israel has done this year, or to impose a no-fly zone, as some members of Congress have called for. The move is Russia's biggest and most public step so far to bolster the government of Syria's beleaguered President Bashar al-Assad, its longtime ally. Rybakov made no attempt to hide the Kremlin's intention to prevent outside forces from tipping the scales in the long and bloody civil war. "We believe such steps are to a great extent restraining some 'hot heads' from considering scenarios in which the conflict may assume an international scale with the participation of outside forces," he said, according to RIA Novosti. Today, Rybakov dismissed calls from overseas to halt the delivery, saying: "We understand all the concerns and signals sent to us from various states. We see that this issue worries many of our partners. We have no reasons to reconsider our position in this sphere." Russian Foreign Minister Sergei Lavrov blasted the notion of selling arms to the opposition, saying such a move would be "illegitimate" and warning it could derail plans by the United States and Russia to bring the Syrian government and opposition together for a peace conference next month. "This decision is quite controversial in itself because the international law bans arms supplies to non-governmental entities," Lavrov told reporters in Paris, according to the Interfax news agency. Rybakov said the possibility of European countries arming the opposition was a sign of international "double standards" on providing arms to Syria. "You cannot declare the wish to stop the bloodshed on one hand, and continue to pump armaments into Syria on the other hand," he said. "At the current difficult and challenging stage related to the implementation of the Russian-U.S. initiative, it is extremely important to refrain from any statements or actions that could be wrongly interpreted by the Syrian parties and push them into continuing armed confrontation rather than negotiations and dialogue," Russian Foreign Ministry spokesman Alexander Lukashevich said, according to Interfax.